After a long hiatus in the US, I returned to Japan with a sense of coming home. 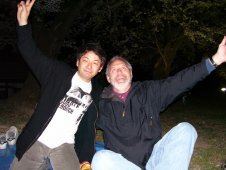 My friend, Mariko, thought it was nice that I thought of Japan as my home. I told Chas that any place he is is home. Today, I realize the feeling of being at home encompasses a combination of factors. On the taxi ride home from the train station I looked out the window, through the rain, at the familiar sights of Koriyama. The signs that seemed a mystery to me a little over a year ago were now mostly legible. The park where Chas and Tetsuya got drunk on Osake and sang Beatles songs (a sweet spring time memory) was wearing its winter garb, reminding me that the seasons had come full circle since our initial arrival. I saw the feisty, weathered oksan, proprietor of my favorite mom & pop vegetable market, sweeping off her stoop with a twig broom and bringing in her cabbages for the night. There was a very determined young man in an official looking uniform, authoritatively waving his baton, blowing his whistle, and bowing to the line of vehicles creeping slowly around a construction site. Teenagers on bicycles, balancing umbrellas in one hand while text messaging on cell phones with the other, and carrying on laughing conversations with their friends while dodging vehicles illegally parked on the sidewalks at the same time, didn’t phase me as the taxi driver weaved recklessly in and out of the line of traffic, driving in both lanes, sometimes in the face of on coming traffic, and ignoring most signals while carrying on a lively conversation with us and his dispatcher at the same time. A year ago the ride would have elevated my blood pressure. A year ago I would never have put together a sentence like that. Today both the bizarre traffic experience and the sentence construction is a part of being at home. You know you have acculturated to Japan when you can put together an entire paragraph of run on sentences and think it is absolutely normal conversation. It works in Japanese, doesn’t it? You know you have acculturated to Japan when drivers coming straight at you in your driving lane, at night, with their lights out, don’t surprise you. You understand they are only going a short way, and they will eventually either get back in their own lane or get off the road entirely when they reach their destination, which is probably presently blocked by you. You stop your car and bow politely as they make their way around you, bowing politely in return. 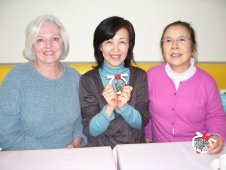 On January 5, I met two of my Japanese friends for lunch. Chas just laughed and allowed as how he probably wouldn’t see me for the rest of the day. Almost true. Yuko san, Taiko san, and I spent a typical 4 hours eating, laughing, and talking in both languages; and looking at their vacation photos. You know you have acculturated to Japan when you think nothing of spending 4-6 hours at lunch, occupying a table in a crowded restaurant; and you know the wait staff will not become impatient, or move to bring you your check until you decide it is time to leave. While I admired first Yuko san’s photos, and then Taiko san’s photos, I realized how alike we are. Everyone’s vacation photos are the same. We all take pictures of ourselves with interesting sights, unique markets, amusing signs, the local people, and food. We all agreed; the most interesting thing about traveling is the food. The conversation caused me to reflect on the role food plays in acculturation. A year ago, I would have said learning the language was the most important step in acculturation. Today, I am aware that language is only a small part. Food is huge. It is impossible to live an American life when you are physically located in the middle of a Japanese neighborhood, surrounded by Japanese people and Japanese food. 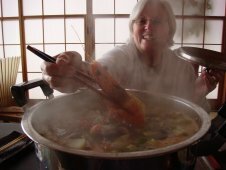 Last winter, although I experimented with Japanese cooking, I cooked mostly American meals. We always chose some unrecognizable meat or fish from the grocery; and congratulated ourselves on our sense of adventure. Meat was relatively easy. Many of the vegetables were a total mystery, contemplated with a wary eye. The dominant vegetable in Japanese cuisine (other than rice) is a large white tuber weighing anywhere from 3-15 pounds, eaten at every meal, and prepared in absolutely any way one can imagine. What is it? What does it taste like? How do you prepare it? 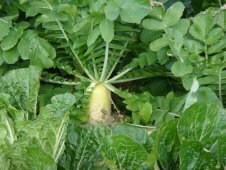 This year we are well acquainted with the majestic, slightly spicy, daikon radish. It is even unique when it grows. It looks as though it simply gets too big for its place in the garden; and it pops out of the soil like a champagne cork. The Japanese prepare it many ways; boiled, broiled, baked, steamed, sautéed, pureed, fried, raw, and pickled. You know you have acculturated to Japan when you go to the grocery store to buy a weeks worth of food and come back with only a 10 pound daikon on your shoulder. We took another important step toward acculturation this year. We bought a kotatsu. 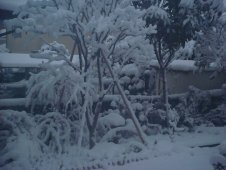 Our families laughed and advised in favor of insulation or central heat. Not available in Japan. 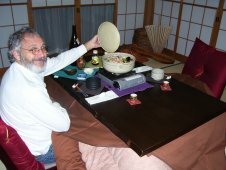 We opted instead for the low Japanese table with a heater underneath and covered with a thick futon (f’TONE). At first we wondered if we would actually find it useful. We immediately began cooking and eating at the kotatsu. A small table top burner and a ceramic pot produced a great soup/stew called nabe (nah bay). The heat from the burner warms the room; the heat from the kotatsu warms the body; and, the heat from the nabe warms the tummy. The Osake warms the spirit. Not a bad start. 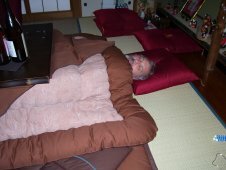 After the first day, Chas was napping under the kotatsu. After the second day, we both had our computers set up on the kotatsu. 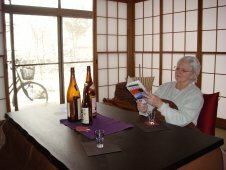 A large bottle of Osake has its own permanent place on the kotatsu. It is a little like staying in bed all day. Did I mention that we have not been cold since we brought it home? Now, when Japanese people ask us what we like best about Japan, we happily shout, KOTATSU! You know you have acculturated to Japan when you think a productive day is one spent sitting at the kotatsu, eating nabe, drinking Osake and watching it snow.